Warning: this MV, like candy, is terribly sweet, does not have much substance, and if too much is digested, may cause stomach and/or headaches. So…ok. It’s not as bad as I was saying above. BUT that’s only because their cuteness redeems them. And because their naive innocence makes their atrocious fashion forgiveable (blue. pleather. overalls. JUST SAYIN.) and whoever is singing the chorus can actually sing. However, 1+2 does not equal 4, kiddoes. Or rather, one B + 4 As does not equal KPOP IDOLS. Right now, they seem like a group in progress. I can’t tell what their niche will be in terms of music style, fashion, or following…besides young, I mean. But hey-there’s nothing wrong with that. Just no more RIDICULOUS comparisons to T.O.P., ok? 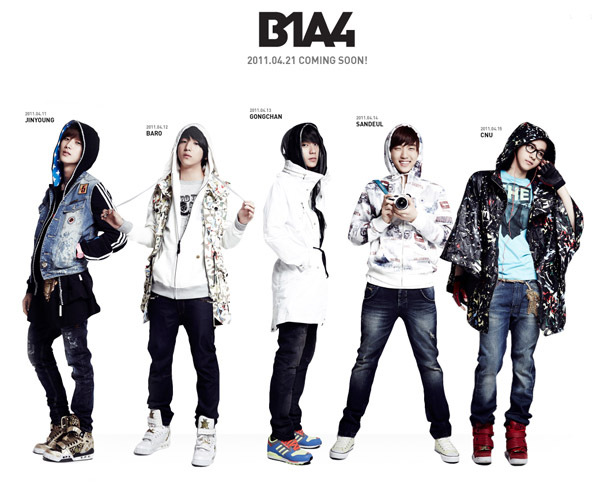 And that’s where I stand with B1A4- just “ok”. Plus, I’m not much of a sweets/candy person myself. I’ll take salty, crunchy, spicy crackers or chips any day. Also, ADHD much video director? Perhaps that was just the camera work, though their youthful vigor onscreen does tire a curmudgeonly old person (with back problems even!!) viewing the MV, like myself.